Home/Feet/Your Health Starts With Your Feet! Feet are complex structures made up of bones, joints, ligaments, muscles, tendons, nerves, blood vessels and skin. How your feet feel can reflect your general health. If they hurt, this may be signal of more serious conditions such as arthritis, diabetes, nerve and circulatory disorders, so it’s very important to be alert to the warning signs. Common feet maladies include corns and calluses, bunions, papillomas and ingrown toenails. These conditions and others can be treated painlessly and effectively by a chiropodist so to prevent further damage, it’s very important for you to address problems, small or large. One very common condition that I encounter is the ingrown toenail, a condition in which the patient’s side of the toenail grows over the edge of the nail, or the nail grows into the skin thereby causing swelling, pain and redness. The most common causes are ill-fitting shoes or improperly trimmed nails such as cutting too short or tapering the corners with the shape of the toe. Other causes include injury, large toes, frequent running, excessively tight socks or even bed sheets that are too tightly tucked! There are many over-the-counter treatments available at the local pharmacy and soaking your feet in warm, soapy water can be effective for uninfected feet. However, if the toe becomes infected, a treatment by a chiropodist is highly recommended. We’ll trim or remove the infected nail with a minor procedure and treat the infection. If the ingrown recurs, we may have to remove a portion of the nail with a scalpel or burned off with a chemical solution so that the nail becomes narrower so that a portion of the nail doesn’t grow back. Another condition is the bunion which is an enlargement of the joint at the base of the big toe. It forms when the tissue or bone at the big toe joint moves out of place, thereby forcing this toe to bend towards the others causing a painful bump of bone on the foot. 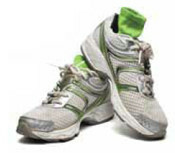 Athlete’s Foot is a term that most of us have heard of but is misunderstood. This condition, despite the name, does not affect only athletes. Rather many of us suffer from this ailment which is a fungus infection that develops just under the skin and predominately occurs between the toes. Athlete’s Foot can be recognized by the initial scaling of the skin between the toes and this skin becomes “moist” or “soggy”. The skin can then flake and peel and often, small blisters develop. The new skin underneath the infected area looks red, sore and inflamed. Itching and burning may increase as the infection spreads. If the condition remains untreated, it can spread to the soles, toenails and even other parts of the body. Fungi thrives in damp, warm environments such as swimming pools, showers, locker rooms, saunas, etc. Not changing your socks or not maintaining good hygiene can lead to this disease. Treatment can consist of antifungal powders, creams and sprays. For more serious or advanced conditions, I may recommend antibiotics. To avoid this condition, make sure you wash your feet regularly, change your socks (preferably cotton), wear slippers in public areas that I mentioned earlier, avoid walking barefoot, and reduce perspiration by using talcum powder. In the next issue, I’ll talk about corns and calluses. If you or anyone you know suffers from foot pain, call us right away. Effective treatment is just around the corner!